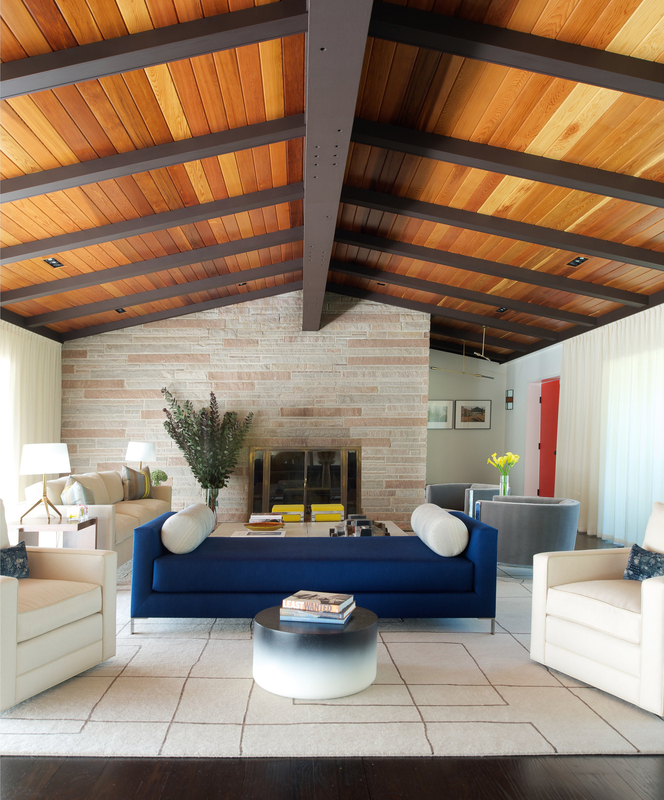 A midcentury house in Bucks County, Pennsylvania—an hour from New York City—was given a necessary update by Stonefox Design for residents Tammy and Robert Sherman. The renovated home maintains its original layout. To refresh the dated appearance of the space, Stonefox added cedar tongue-and-groove panels to the ceiling and refinished the floors. The living room rug is from Creative Matters, the WL Daybed is from Niedermaier, and the circular coffee table is a Tie and Die model from Holly Hunt. A vintage bar unit, a Tube Chandelier by Michael Anastassiades, and a David Harouni artwork are highlights in the open-plan living and dining space. The architects removed heavy paneling from the walls to lighten the space. Sorenthia Lights by Studio Dunn hang in the entryway. The cozy den contains an A. Rudin sectional sofa upholstered in fabric from Lee Jofa. The residents decided to convert a koi pond on the property into a petite pool. Next steps for the renovators are updating the kitchen and increasing its size by expanding it into the mudroom and laundry room.